Oliver Clare was born in 1853, to the renowned still-life artist George Clare. 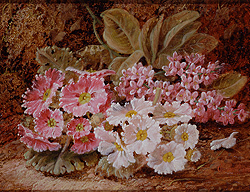 The Clare family members were Victorian artists who specialized in, and were well known for their highly finished and precisely detailed still life and flower paintings. 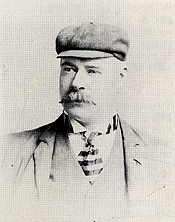 Oliver spent most of his artistic life in Birmingham. Though there are no records indicating where he received his training, one can be quite certain that most, if not all, of it was from his father. Their stippling technique and choice of subject matter are almost identical. While Oliver lived in Birmingham he was commissioned by a local health firm "Health Food Stores" to paint still-lives to be reproduced on postcards and posters. Clare exhibited many paintings throughout his lifetime and is most often associated with the Artists of the West Midlands and the North. He exhibited: eighteen works at the Royal Society of Artists, Birmingham; three at the Walker Art Gallery, Liverpool and six at the Manchester City Art Gallery. Throughout the late 1870's and early 1880's he lived in London where he exhibited several works there at the Royal Academy and the Royal Society of British Artists, Suffolk Street. He (Oliver) was particularly gifted with animals. He taught his dog to stoke the fire and collect fruit from the greengrocer. On the night he died (in 1927), he sang 'Abide with me'[:] his dog died that same night.